In the past 30 years, public awareness of the far-reaching effects of global warming has dramatically increased, and billions of dollars have been poured into clean energy research projects of all kinds. One of the most important clean energy initiatives to emerge in recent years has been the development of hydrogen fuel cell technology for the purpose of making environmentally friendly vehicles. On August 8, 2005, an important piece of legislation known as the Energy Policy Act of 2005 (EPACT 2005) was signed into law by President George W. Bush. The act modified several components of U.S. energy policy in order to provide incentives such as tax breaks and loan guarantees for innovations in the area of renewable energy and eco-friendly technologies. This act proved to be a boon for hydrogen fuel cell researchers and developers, bringing fresh interest, investment and innovation into the sector. So what makes hydrogen fuel so appealing as an energy source? In comparison to fossil fuels, hydrogen fuel carries a number of important advantages. For starters, hydrogen fuel-powered vehicles are zero-emission, meaning that they emit no waste products or harmful pollutants into the environment. The only substance that is produced when hydrogen is burned is water vapor, which is unquestionably eco-friendly. Hydrogen also has incredible energy density in proportion to its weight. According to a report published by the Institute for Technical Thermodynamics in Stuttgart, Germany, hydrogen’s energy density weighs in at approximately 35.7 kilowatt hours per kilogram of weight. This makes hydrogen an extremely energy efficient resource in comparison to traditional fossil fuels. A vehicle that is powered by hydrogen fuel can go roughly twice the distance of a vehicle running on an equivalent amount of gasoline. Hydrogen in its purest form does not occur naturally in enough quantity to be useful, but it can be manufactured using a variety of industrial methods. One of the most popular hydrogen production methods is known as steam-methane reforming, where hydrogen is extracted from a combination of steam and methane in a high-temperature endothermic reaction. Another hydrogen production method is water electrolysis, where electricity is passed through water to separate the hydrogen from the oxygen. Once hydrogen has been manufactured, it is considered to be an energy carrier, which means that it is not an actual source of energy but rather an efficient “storage container” for energy that was first generated by other methods. By way of hydrogen fuel cells, this energy can be stored and used to generate heat and electricity, or it can be burned to power a combustion engine. The fuel cell itself consists of a pair of electrodes, one of which is negatively charged (anode) and one positively charged (cathode). Oxygen from the air travels over the cathode while hydrogen travels over the anode, producing water and electricity. 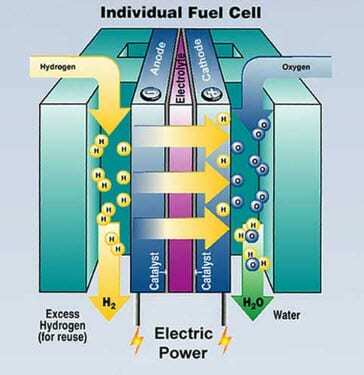 The fuel cells are combined into “stacks” in order to generate enough power to run the vehicle. 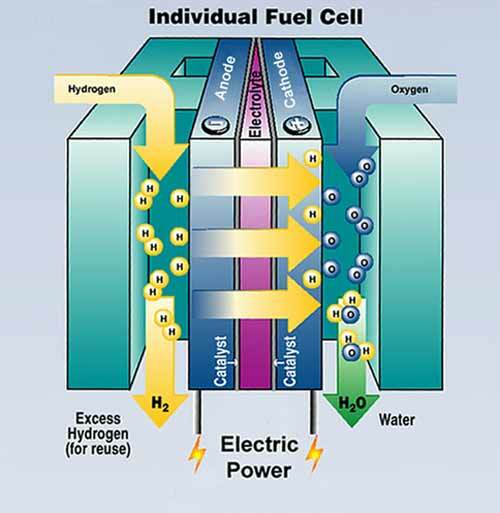 Most hydrogen fuel cell vehicles are equipped with a tank that carries pure hydrogen, which is compressed and fed into these fuel cell “stacks” to produce the electricity that runs the vehicle. The end result is a clean-burning, quiet and yet powerful vehicle that has no negative environmental impact. Many economists speculate that although hydrogen fuel cell vehicles will increase in popularity over the coming decade, the current costs to liquefy the fuel are somewhat prohibitive in the short term. While there are obvious advantages to hydrogen fuel cell vehicles, there are still quite a few research and development hurdles to overcome before they will become a common sight in our local dealerships and on our streets. Bradley Taylor has an overwhelming love for everything automotive design and technology start-up companies He’s a big fan of luxury cars and you can always find him on Google+ or Twitter.